Now that the iPhone5 has been announced, hundreds of Apple fanboys and girls are on Kijiji trying to dump their old handsets. 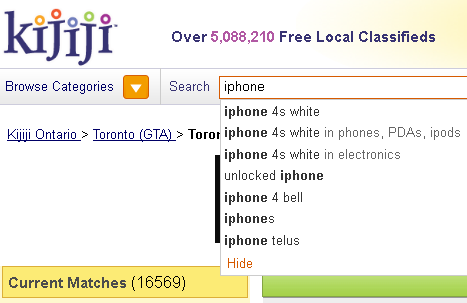 If you're out to buy an iPhone 4s or iPhone 4 on Kijiji, learn what to look for. Kijiji's Bart Molenda told Global BC the average prices currently sit at around $370.00 for an iPhone 4 and $540.00 for an iPhone 4S on Kijiji. Bart says the demand is still high, with nearly twice the demand for the iPhone 4 model as compared to the iPhone 4S. iPhones on Kijiji? More than 16-thousand listings in Toronto! So, if you're on the hunt for a good iPhone deal, get on it! Supply may exceed demand right now, so if you make a sensible (read: NOT AN INSULTING LOWBALL) offer, you may get a good deal. Check out our previous post about the Pros and Cons of Buying a Used iPhone on Kijiji.